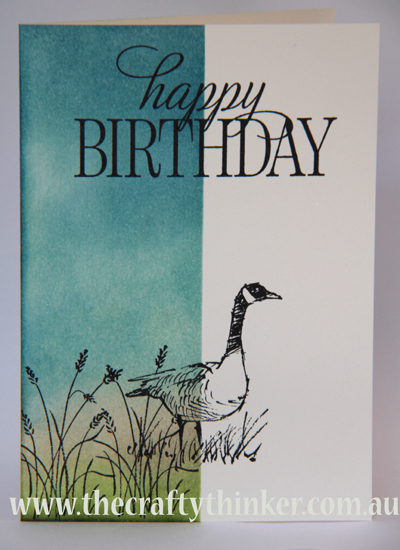 In need of a quick but effective birthday card (February seems to be a very busy month for birthdays! ), I made this. What I like about it most is that it's suitable for both genders! I simply masked off part of the card (in this case half of it) with some scrap paper and sponged on the colours. I used shimmery white cardstock because it has a good weight for a single layer card but is also a very nice surface for sponging and watercolouring. I started with Pear Pizzazz at the bottom then blended in some Sahara Sand followed by Soft Sky. Then I brought some Marina Mist down from the top and added a tiny bit of Mossy Meadow to the bottom. Having removed the mask, I then stamped the images from Wetlands with Archival Black ink. I used a Stamp-a-ma-jig to get the positioning exactly as I wanted it. The last thing to add was the greeting from Happy Birthday Everyone. All finished in no time flat! This is an awesome card. I can't wait to make a much. Thanks for sharing!!! I just cased your card for my father in laws birthday. I am really like the Stamp-A-Ma-Jig. Need to work on the placing still but overall very happy with the end product. Thanks. So glad it worked for you and thank you for letting me know! To be honest, my Stamp-A-Ma-Jig is one of my most used tools! I often use it just to test out ideas before I commit them with ink to paper!